I think lucite has finally lost its bad connotation with those type of working women... & now this futuristic material is popping up more & more in both home design & even fashion. I have been spotting these trendy clear heels left & right, & must say that I am on board team "Let's Dress Like We Are In The Jetsons"... who's with me? This pair & the Kate Spade pair (#1) are my favorites for summer! I've always thought it was kind of cool. But you are right it did have a few negative stereotypes. Love the shoe collection. hmm... still not a fan. To each their own, but the lucite is just now for me. I'm still undecided on lucite, although I do really love that Kate Spade pair!!! Definitely no. 4.. very subtle and I think comfy too! 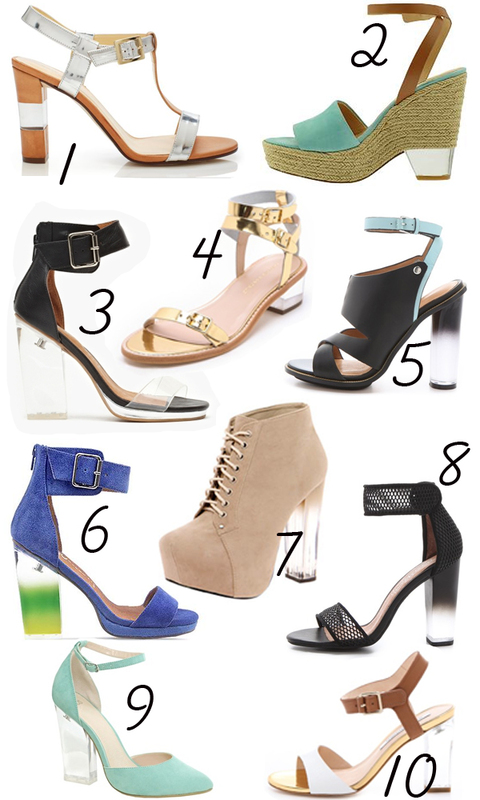 I bought the Jeffrey Cambell heels back last fall and love them!! Mmm, if they've lost that connotation this is the first I'm hearing of it. I still don't care for them. I gave up on plastic shoes after I hit double digits. I actually really like this trend! Not sure if I'd wear them myself but I do enjoy them in magazines and on the runway. i'm a fan of lucite furniture for sure, but hadn't thought about heels! i'll have to give these shoes another look! 1, 4, & 9, PLEASE! love the ombre heels so chic. All of these, PLEASE! Especially number 8 & 4.